It was a diabolical threat by Issayas Afewerki Abraha Miratch to the four – six million people of Eritrea. Let us admit. He accomplished his threat without a shadow of doubt. Eritrea is now under his ‘Boots’ – and no doubt, he will do more before he is forced out by Nature or fluke [NOT by Eritreans; the reason for which will be discussed below. During the thirty-year (30) Struggle for Liberation and four (4) years after Liberation, the Eritrean people at large — and in particular, his closest comrades – DID NOT have a clue of ‘who Issayas was’, incredible and unbelievable as it sounds. Issayas was glorified as a Semi-God; and as a SAVIOUR of ERITREA. In the epic of his glorification period, a person heard criticizing Issayas in down town Asmara would be risking his/her Life right on the side street. Surprisingly, still, there are Eritreans who glorify him, without a limit. An honest Lady asked her closest relative in a whisper: እዚ ኢሳያስ፤ እንታይ እዩ ጌሩኩም፣ሽሙ ተጥፉእዎ?! Indeed, Issayas had, and still seemingly have, hypnotic quality upon Eritreans. 1st. When Issayas daringly ordered the rounding-up of eleven (or so) of his top most comrades, at exactly 0300 hundred hours and threw them to oblivion, not a single Eritrean Fighter, nor a commoner, came out to protest. The Nation of Eritrea quietly accepted the nightly arresting of gallant freedom fighters. It is a ‘black’ spot that Eritreans will, for ever, carry upon their consciousness. 2nd. Issayas also took advantage, as necessary, the everlasting phenomenon of RELIGIOUS inherent friction that existed in Eritrea for seemingly time immemorial. In short, RELIGION becomes – NOT personal spiritual belief – but a factor in civil administration of the country. And that has never been a healthy situation in any country. Eritrea was saddled with it for many decades and will probably continue so until disintegration. 3rd. Issayas was also very conscious with matters pertaining to REGIONS, RACE, TRIBES, etc. We are still divided by that age-old disease – no matter how much we pretend to deny it. We never wanted to admit it, nor reject it, with rational debate (expose’), in either way. It is always through INSULTS that we attempt to bury our weakness – a reaction that has been accepted as a proof of our lack of rational ability to debate. The daily commentaries on the Internet is the proof. Where do we go from here? Why do have 80 – 90 diversified groups? How do we get together on one common interest (agenda)? Do we in fact have a common goal? Or are we pretending to go through the usual motion of occupying ourselves with deception? By the way, a good example of that last question is the fact that we do not utilize the space we are freely provided with by www.assenna.com. Instead of using it as platform to produce a common solution to our common problems, we spend our time INSULTING and MANIPULATING each other in order to achieve our separate HIDDEN agenda, based on religion, region and other factors of self-interest. I have been saying it for years.Our brothers & sisters have been duped by gedli to establish a fake country(as you also put it) or a country with a non=eritrean agenda.ምቕሉል መራሒና ኣቢይ ኢጣልያ ኸይዱ ብወደብና ባጽዕ ይማያየጥ ኣሎ…ባቡር ሓዲድ ካብ ምጽዋዕ ናብዛ ሓዳሽ ዋና ኸተማና ኣዲስ ኣበባ,ቅድሚ ኣዋርሕ እውን ስዑዲን ዒማራትን ከይዱ ብዓሰብ ተዛትዩ. ንሕና ምንም ዘይንብለሉ ምኽንያት እዚ ጽሓፋይ ዝገለጾ እዩመልሱ; ከምቲ ሕጂ ንጸራረፎን ንዋራረዶን ዘለና እቲ ገድሊ እዋን ካብኡ ብዙሕ ኣይፍለን እዩ ኔሩ !!! እቲ ኤርትራውነት ካብ ቆርማዳት ዓጋመን ኣእዱግ ኣምሓራን ንምፍላይ እዩ ኔሩ ! ኣባልዓ ስፓጌቲን ካልቾን ስለዘይፈልጡ !!! ታሪኽና ን 3500 ዓመታት ምስ ኣቢሲንያን ኣኽሱማዊ ስልጣነን ዝተተሓሓዘ እዩ ኔሩ ሕጂ ድማ ተደሚርና ናብኡ ተመሊሱ !!! I am sure you are writing this nonsense from the comfort of your home in North America or Europe. The poor country is emptied of its able population at the moment not because of the threat of war from Ethiopia or Woyane/TPLF but because of toothless, spineless so called oppositions like yourselves wasting time with bluffing and rhetoric. It is well over time to focus on real Eritrean solutions and actions. Contrary to your cowardice and hypocrisy Eritrea had better freedom and wealth in the past. Dear Aditekelezan – Hakegna seb – always the truth teller (truthful person). I really don’t give a damn to the sentimentality of fake independence. When you witness the entire ‘Voluntary’ mass exodus of citizens from an ‘independent country’ to anywhere else including to the one you fought bitterly (for 30 yrs) against to become so called independent. We’ve seen countries becoming independent for worse, we’ve also seen nations merging and giving up their separate status for better. I don’t champion independence for the sake of it if the net benefit for citizens is out weighting the cost. Indeed brother Aditekelezan, our ghedli have been disastrously duped. The deadly problem was not identifying who was who. I hope the traitor who destroyed Eritrea will have a restless life looking for a place to call home. Dear Rezen I am among the few who commented on your articles. You expressed your disappointment and castigated that your intentions were to create a genuine debate on the current situation in Eritrea. I fully agree with you.. But, what do we debate and how do we debate is a question we have to crystalize. Otherwise it would be an academic exercise devoid of any concrete outcomes. As I mentioned in my earlier comment, no nation in this world is perfect. And we are no exception. Perfection and infallibility is for the Gods. Attempting to draw conclusions from specific instances in our current predicament is erroneous, misguided and biased. Can you judge the German people for Nazism? Can you judge the people of Soviet Union, East Germans, Polish, etc for flaw of character and submissiveness during the communist regimes? Can you blame the peoples of the United States for being subjugated by the British colonizers for hundred of years? I can go on and on. My comments on your articles stemmed out from the prejudiced premises you base your argument. If you want to make an all rounded and introspective assessment of the situation, you should define this problem vis-à-vis the present status quo, instead of questioning the character of the people. Similar to any other country in the world, we are composed of numerous religions, ethnicity, regions, etc, but we have lived in harmony for time in memorial. We fought together in the same trenches together. O.k, there may be some issues that we ought to tackle. But we don’t have mind bogging issues like in Ethiopia. To sum-up, l agree with you that we should have dealt with this evil dictator quite a long time ago. And rest assured he will go. Peaceful attempts like the 1991 tegadelti’s demand, the G-15 movement, the Wedi Ali mutiny, the Brhane Abrehe bold public defiance did not work. People will thus resort to the only other option. Like all dictators, esayas shall face his only fate soon. Neither his mother’s womb nor Adi Hallo could hide him. The wrath of the people will descend on him. Time is ticking and he knows it!!! Ato Woldegabriel, we humans are a mixed bag. There is good and bad in all of us and history is full of such facts. And so we must straiten our backs and work for our real freedom of our future, blaming Rezen for his excellent and timely articles is NOT going to help at all. You reap what you sow, indeed. Your Eritrean opposition groups have spent all this long time squabbling about issues less pertain to the dire situation in Eritrea. And now unashamedly you talking about mind boggling Ethiopian issues and problems. Dude, when are you going to get real and look into your mirror? My brothers and Sisters, it is mind bugling why the G-15, and many more after them who are eliminated did not know who Issayas is? As it has been said Issayas has been working to eradicate Eritreans, and kill the Eritrean nationalism for good. At this time to cry over a spilled milk will do us any good. Instead we need to put our heads together, and be united to reverse the damage that has been done, and prevent Eritrea from been handed to Ethiopia. The time is running out. Once Ethiopia is stabilized, and Aby consolidate his power, it will be too late. 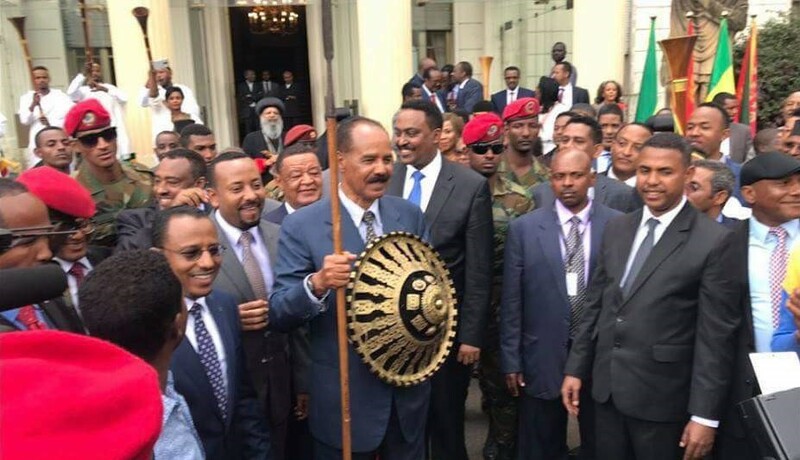 They will create joint army, where Eritreans will be controlled by Ethiopian army, and there will not be any military threat for Issayas. Issayas know well that those of us in a diaspora will not do any damage more than working the computer.